Lync Online provides business with an enterprise-class instant messaging solution, complete with real-time presence availability and interactive meeting and conferences. Lync gives organisations a professional alternative to phone, email and face-to-face meetings – complete with file sharing, desktop sharing and online whiteboards. Lync gives users real-time presence information – lettings others know their availability and location – helping them to connect more efficiently and effectively. Users can create, moderate and join organised or on-the-fly meetings with people inside and outside the organisation using audio, video and interactive tools. 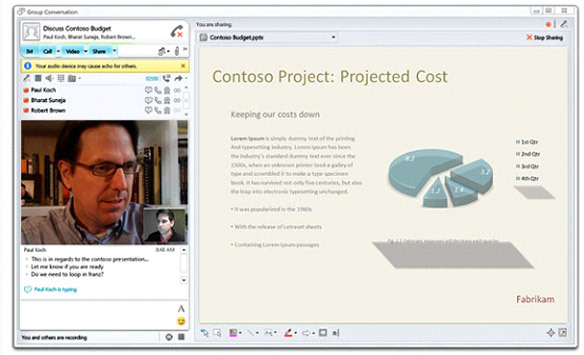 Lync was built to work hand-in-hand with Microsoft Office for a consistent, familiar experience. Lync makes communicating easier and more engaging by delivering a consistent experience across computers, browsers and mobile phones. Share photos, files, and links through chat or join a web conference with voice, audio, and video. Enhance online presentations with screen-sharing and virtual whiteboards. Speed up your search with help from pictures, skill search, and location information. With pictures, activity feeds, and automatic frequent contact lists, you can engage even more with the people you talk with.